Pay Eurabia, pay! German and other Euro degenerates, pay! White Slaves, pay! But it won’t be enough to keep UNRWA afloat, German Foreign Minister says in letter to other EU member countries. The #EU is not a union. It’s a political coup d’état. People have seen through it, and it’s falling apart. Soon it will be gone. As for shared values, we believe in democratic self-determination. We have no shared values with you. 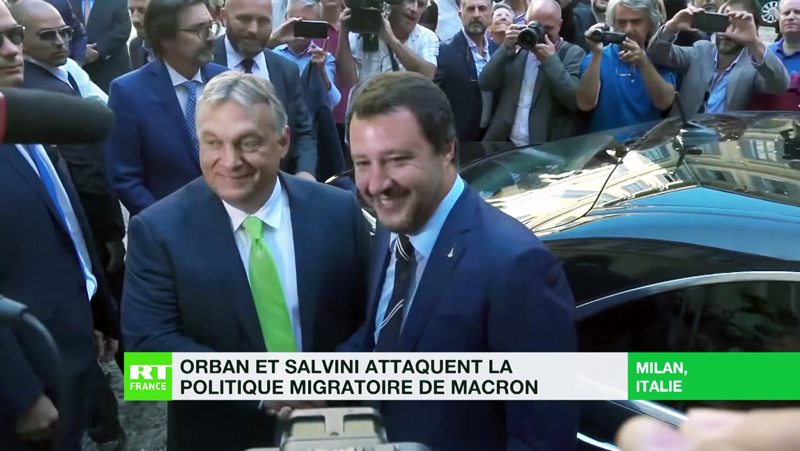 Hungarian Prime Minister Viktor Orbán and Italian Interior Minister Matteo Salvini meet in Milan, Italy on August 28. She didn’t. She did it deliberately to destroy Germany & the European nation states. One of Merkel’s closest advisors is Gerald Knaus, a Soros apparatchik. Merkel, a former Stasi operative, is fully committed to population replacement. Italy’s Interior Minister Matteo Salvini, head of the anti-immigration . A popular revolt against population replacement is not “racist violence”, it is an absolute necessary act of self-preservation. “I would say that Angela Merkel certainly underestimated the risk of a social clash when she claimed that there was space for hundreds of thousands of people in Germany,” Salvini told German public broadcaster Deutsche Welle in an interview late on Monday. Is a single German province more of a ‘front line’ on migration than Italy? Most recently, far-right extremists have rallied in the eastern city of Chemnitz after a German man was stabbed to death on August 26th, with an Iraqi asylum seeker the prime suspect. Images of far-right protesters chasing down foreign-looking people in violent demonstrations and of neo-Nazis giving the Hitler salute in front of lines of police officers have stunned the nation. Salvini has taken a tough anti-immigration stance since his hard-right League party formed a government with the populist Five Star Movement last June.